The adoption process can be summarized as a courageous act for everyone involved. From birth parents putting their child up for adoption to offer him or her a better life, to adoptive parents looking to grow their loving family, everyone takes on the challenges and stressors of this process for the benefit of the child. 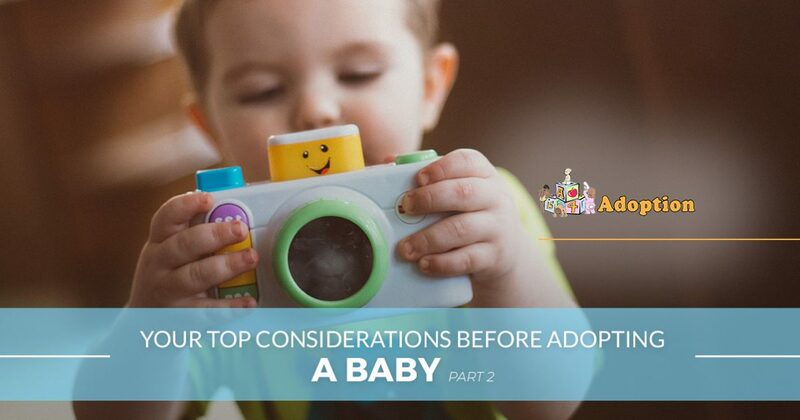 If you are considering adopting a baby, it’s important to go over all of the considerations involved with this big decision. Adopting a child can provide a new opportunity for this little one, but it also affects your life both now, and in the decades to come. Many potential adopters seek out an adoption agency in California to help them grow their family. Oftentimes, months of waiting and inconsistent communication can put a major strain on the adoptive parents. Instead, turn to our adoption center! A is 4 Adoption is here to help match you with a birth mother in need, yielding the best results for everyone involved! We’re here to help you every step of the way, which is why today’s post will conclude our look into major adoption considerations. When you’re finished, be sure to contact our staff to learn more about our top-notch adoption services! Closed adoption is the process in which the information of the adoptee’s biological parents is sealed. Neither the birth parents nor the adoptive parents will be able to contact the other. In specific cases, this may prove to be a very beneficial choice. Open adoption is the opposite of the former option, giving families the ability to learn about one another and choose the level of interaction that would best fit the situation. Every situation is unique, so be sure to think about your adoption goals before getting started! Our adoption center is here to help you find the best solution for your family. A is 4 Adoption is available every step of the way, delivering expertise to ensure you are happy with the results. We rely on a vast network, and a reputation for delivering quality results to ensure that your new baby is found, and expeditiously. Gain insights. The adoption industry can be vast and complex, making it beneficial to reach out to others for personal insights into the best approach for adopting a child. Personal experience from a loved one may be the insight you need to make your decision. Finding a child. The private adoption process can rely on adults reaching out to friends, loved ones, and colleagues to find a mother looking for adoption services. In the end, it won’t matter if you adopted your child through a close friend, or an adoption center! Talking about adoption is often a great first step in the process. You can reach out to friends, community groups, online forums, and more to learn about the considerations and joys of adoption. Incorporating adoption into your daily conversation may prove to be an amazing choice! One consistent theme of adopting a child is that it will cost you. Many families take on the adoption process knowing that it will be costly, but some people may not realize the full scope of these costs before jumping in. It is important to remember that the costs involved with your process will vary widely based on the particular routes used. Working through a public agency can provide financial benefits such as subsidy assistance. Keep in mind, though, that an adoption agency will be in control of all of the decisions, such as scheduling, fees, suitable adoptees, and more. Another cost of adoption is time. Many adoptive parents are happy to invest the money needed to grow their loving families, but the costs of waiting can prove to be heavy. If you and your significant other are hoping to adopt a child right away, be prepared to wait. A is 4 Adoption was founded to minimize this period, so be sure to reach out to us for assistance when you are ready to proceed! Domestic infant adoption is available across the country, but varying state laws can drastically affect the costs. As always, be sure to work with your representative to find the best fit for your life. A is 4 Adoption is here to serve as your trusted guide through the adoption process, delivering comprehensive assistance every step of the way. We work to facilitate your adoption plan to ensure that everyone involved experiences the best outcome. If you are on this page looking for an adoption agency in California, turn to our center instead for personalized care. Contact us now to learn more and be sure to fill out our adoption application form!